Susan Shumsky is a well-known, longstanding spiritual teacher who has moved in some celebrated New Age circles over her 45 year career. 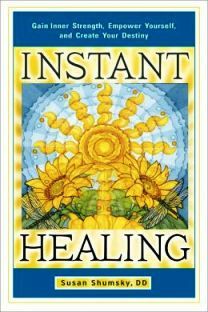 Her new book, 'Instant Healing', is essentially a universal prayer book. I've often been struck by how some New Age spirituality seems to merge with more mainstream religious practice. New Age philosophy can sometimes seem like a rather off-beat offering, where the mainstream religious belief system morphs into a vague, multi-denominational format encompassing an ultra-broadband pantheon. But, at the centre is still a belief in God, and a belief that prayer to that God can make things happen in an individual's life. 'Instant Healing' moves things in that direction - and beyond - in a pretty overt way, with 243 prayers and healing affirmations written by Susan Shumsky for readers looking to connect directly with God. Self-determination, Gnosis and building inner strength are key features of her philosophy. As I've mentioned before when reviewing similar offerings, the power of positive thought is undeniable. Self-help books provide support for anyone wishing to improve their lives, and need a pep-talk or two along the way. I don't know whether support is also available directly from God, or whether a link can be attained to tap that spiritual strength. But if it can, then I imagine that Susan Shumsky's methodology is as good as any other. Belief and faith are strong parts of our character, and placebo effects are recognised phenomena. So, it makes total sense that belief and faith, with its accompanying programme of prayer and dedication, might provide some positive outcomes - enough for the author to claim that Affirmative Prayer Treatment/Scientific Prayer have been "proven millions of times" (p13). There's a big gap between individual anecdotal evidence and scientific evidence, of course, but on an individual level a book like this might help transform one's state of mind 'in an instant', or help one move towards a variety of desired goals (p18). The author claims more still - the potential to generate our own miracles (p29). The book moves through a plethora of prayers - helpfully and clearly indexed in an appendix to help the reader track down the right affirmation for any given context. It is here that this universal prayer book steps off the mainstream religious path, exploring Spiritual realms and beyond. The protection prayers reminded me of those I've seen used by Spiritualists. Clairvoyant sight is explored, and how that helps identify and deal with "psychic ties" (p38). There's even a section on overcoming religious brainwashing, and prayers to counteract 'spiritual elitism', including liberal humanists. A chapter about Near Death Experiences brings in topics like spirits living in the astral world, the vibrational level of the atmosphere, Past Lives and how remnant aspects of these lives in our psyches can manifest as a mental body surrounding, possessing or oppressing us (p97). "Reptilian beings, working with demonic energies from the lower astral world, consciously incarnate with malevolent intentions. Their motive is to cause confusion and energy drain, and to confound light workers and spiritual leaders who are lifting the planet. This so-called reptilian energy is a dark astral energy, not extraterrestrial. Prayers to deal with possessions and black magic pull the book back towards the supernatural, rather than the paranormal. Then, after this maelstrom of weirdness, the narrative (such that there is in a prayer book) shifts ground towards the more foundational layers of Maslow's pyramid. Health, money, wealth, prosperity, success, happiness: The key to achieving all of these 'normal' goals is Faith, says the author. It's been a long, strange trip to be sure, but in the end she leads the Faithful home. Subtitled "Gain Strength, Empower Yourself, and Create Your Own Destiny"